Only one national poll had been conducted for the month of December, but in January there were four, in addition to one survey done entirely in Quebec. If we compare January's numbers to the last month with some decent polling, in November, we see that not much has changed - though the Liberals and New Democrats swapped about a point. I finished writing "Tapping into the Pulse" yesterday, and I am going through the final revisions. Then the book will go through the process of being turned into a readable ebook! I hope you'll find it interesting. I have certainly enjoyed writing it. If you haven't already, please consider putting in a pre-order to reserve your copy. You'll get a sneak peek of the first three chapters when the book is released to the Kickstarter backers on or before February 28! The Liberals averaged 35.5% support in January, down one point from their average support in November. The Conservatives, who stopped a three month decline in January, averaged 28.4%, a gain of 0.5 points. The New Democrats were up 0.9 points to 24.3%. The Greens were up 0.5 points to 5.4%, while the Bloc Québécois was down 1.5 points to 4.9%. Support for other parties stood at 1.5%. Comparing the four national polls conducted in January to the last time these firms were active within a similar window, we see the New Democrats have made a significant gain from a particular low level. Compared to polling by the same firms done at the end of October, the New Democrats were up 2.6 points. The Liberals dropped 1.4 points and the Conservatives fell 0.6 points. At the regional levels, the Liberals continued to lead in British Columbia, Ontario, Quebec, and Atlantic Canada, with the Conservatives ahead in Alberta and the Prairies. In Ontario, the Liberals dropped 1.9 points to 37.4% but they have been between 36% and 38% for five months now in the province. The Conservatives picked up 3.8 points since November to reach 34.9%, their best result since April 2013. The New Democrats were down 1.3 points to 21.6%, while the Greens were up 0.6 points to 4.6%. The Liberals gained 0.7 points to reach 36.7% support in Quebec, their best numbers since August 2013. The NDP also reached a high since then, up 3.4 points to 28.8%. The Bloc reached a low since August 2013 with a fall of 3.3 points to 18.5%, while the Conservatives were up 0.4 points to 12.5%. They have been between 12% and 13% for seven months now. The Greens were down 1.5 points to 3%. The Conservatives were down 1.3 points in the Prairies to 35.6%, while the Liberals dropped for the third consecutive month to 30.2%, a fall of 5.9 points since November. 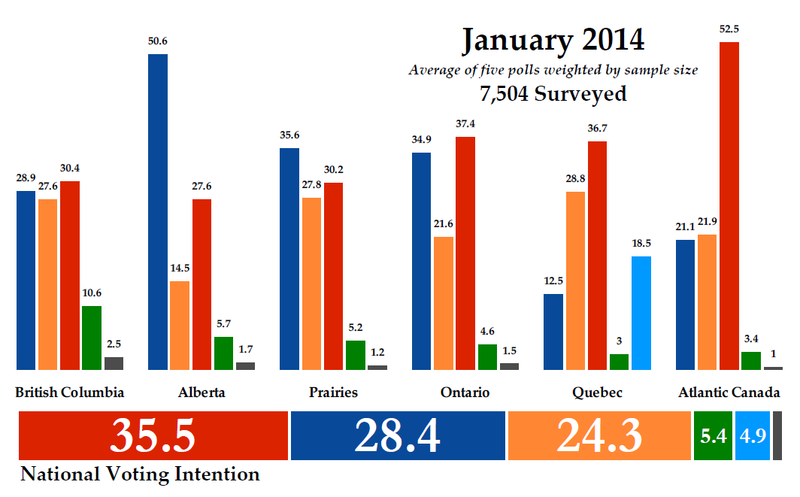 The NDP put up their best numbers since January 2013, with a gain of 5.4 points to 27.8% support. The Greens were up 1.1 points to 5.2%. In Atlantic Canada, the Liberals were up 5.1 points to 52.5%, while the NDP and Conservatives were both pegged at less than 25% for the third consecutive month. The NDP was down 0.7 points to 21.9% and the Conservatives were down 3.7 points to 21.1%. The Greens slipped 0.7 points to 3.4%. The Conservatives dropped 5.9 points to 50.6% support in Alberta, their lowest level since May 2013. The Liberals were up 8.4 points to 27.6%, their best since then. The NDP was down four points to 14.5%, while the Greens were up 1.6 points to 5.7%. And in British Columbia, the Liberals decreased by 4.7 points to 30.4%, followed by the Conservatives at 28.9% (+1.6), the NDP at 27.6% (-1.3), and the Greens at 10.6% (+3). The Liberals dropped most of their seats in Ontario, falling seven to 53. They were also down two seats in both the Prairies and Quebec. But they were up two seats in Alberta and three in Atlantic Canada. The Conservative seat gains were in Ontario, where they picked up eight. They were also up one in British Columbia, though they were down one in the Prairies, two in Alberta, and three in Atlantic Canada. The New Democrats gained 10 seats in Quebec and three in the Prairies, while dropping one in Ontario and two in British Columbia. January showed a continuation of what we had seen in 2013. The Liberals retain the lead, which they have held now since April 2013. The Conservatives remain below 30% and the NDP is stuck in third. There are some interesting regional contests, though, with a three-way race persisting in British Columbia and Ontario and Quebec hardly decided. Éric, to boost your sample size for December you could add Forum's belatedly revealed numbers (shown in their January poll reports), which would make the averages something like LPC 35 CPC 29 NDP 22 and reinforce your narrative about not much changing over the last few months. There were no regional results published, so I've disregarded the poll. Ah yes, I hadn't thought of that. Because of the Victoria by-election (and the fact that going from 7.7 to 10.6 in BC is the equivalent of a boost of more than one-third). Most of Andrew Weaver's riding lies in the Victoria riding too, suggesting that this wasn't just a blip. The Greens have a lot of organization in Greater Victoria. By-elections are strange beasts and Weaver won because he was a very star candidate. The Greens have potential to win Victoria but, to do so they will need another star candidate. The "average run-of-the-mill" Green candidate would not be able to pull it off. If there is one riding where the Greens can recruit a 'star' candidate, it is in Victoria. No where else can they give a candidate a reasonable shot of winning. Donald Galloway was a pretty solid candidate too. If he decides to run again he's who I would bet on winning. I'll continue to remain a skeptic the accuracy of pollsters being what they are of late. I thought that your model was based on the swing from the last general election and didn't include midterm byelection results. I suspect the Greens will be a factor in Victoria next time - but the byelection was their big opportunity and in a general election they will be drowned out by the air war from the major parties. By-elections are also taken into account. When the result of a by-election was significantly different from the results of the previous general election, the proportional swing is applied to the by-elections results based on how current polling levels differ from where the parties stood in the polls at the time of the by-election. Why didn't 308 do a profile on the byelections? You did one on other byelections. I hope it wasn't because the results reflected poorly on the Liberals. This site is predominantly filled with good news stories for the Liberals and bad-news stories for the NDP. That is a product of the Liberals doing well in the polls and the NDP doing less well in the polls. When the NDP does better in the polls, I'll write good news stories about them. I didn't profile the by-elections because I had put off the January federal averages for too long, and I didn't want to write too much about the Forum polls after the misses of November 2013. Or it was a conspiracy. Also, I seem to recall a lot of good news stories I wrote here last year about the BC NDP. Eric - I don't suppose you have numbers for the new Delta riding handy do you? My riding association's founding meeting is Saturday, would love to be able to tell folks where we stand. You know it wouldn't be accurate to present it that way, though. It gives a decent idea of the big picture. Obviously we'll do our own internal polling down the line, but it'd be interesting information to say the least. Now, be sure to share the results of your internal polling with all of us when you have them. I get my numbers by using the trend for every riding compared to the regional trend for the past 4 elections, using the differential of the last election only and adding the result to the regional numbers. I'm still a bit unsure about the "last election trend", but my numbers seem better with it than without it (if I take a look at my Québec seat count, since that's where I live and have a better feel of how things are playing out).